Where Can I Find Your Art-O-Mats? Location missing? Leave me a comment below so I can add it to the list! :) I update these each time I get a list from HQ. Thanks for looking me up! Most of the machines have pictures on the artomat.org website and I have linked them to the location names in the list below the map. As you can probably tell flipping through the posts, I have seriously messed up my numbering system this year. Who knows what is what! If you happen to find your slice of landscape in one of the shots, I would love to hear from you in the comments! Let me know where you picked up your artwork and the number. Starting February 2018 I am making these longer landscape series as you see below. I will also be making one panel original watercolor works and prints based on these art-o-mat series, to make them accessible to those who are not close to an art machine or if you fall in love with them. I started painting longer watercolor landscapes spanning several surfaces in 2007. 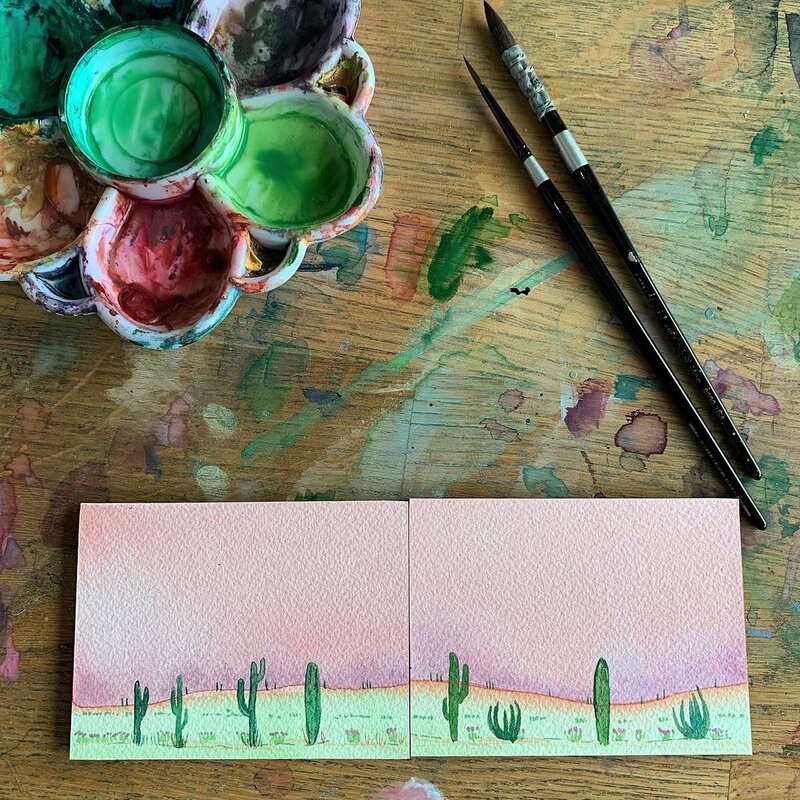 Just as we take pieces of the landscape with us in our memory of childhood, when visiting far flung places or exploring your current place on the globe, I paint snapshots of the landscape. I love the idea that several people have a piece of the whole, we are what connects us. Some of these have canvas, all-in-one, paintings. Those that do are noted beneath and have a link to the canvas inspired version. 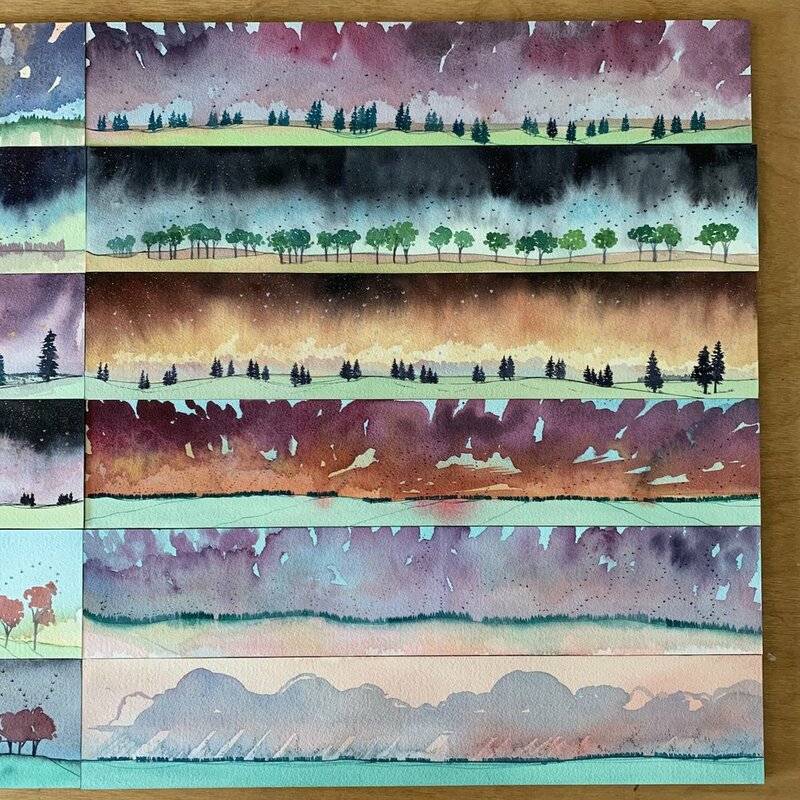 Would you like a panorama piece based on the color series below? Click Here for Commission Inquiries. Art-o-mat® machines are retired cigarette vending machines that have been converted to vend art. I am super excited to share this site with you! I have been working with Artomat for two years now, creating tiny little paintings to start or add to your personal art collection. Along with hundreds of other artists around the world, and with the lovely people at Artomat HQ I am able to be a part of re-purposing these cigarette machines into something fabulous! In these earlier sets, on paper, each painting is its own world, usually in a vignette style. I used these little paper pieces as a sort of sketch book to work out different compositions, lines and color schema. 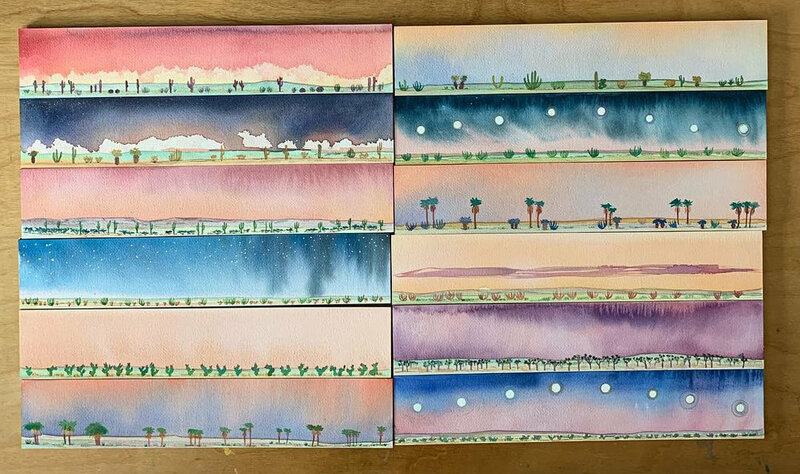 Of course, these little guys inspired larger works based on the original and eventually led me back to an idea I had long ago about taking a larger piece of the landscape and dividing it amongst many collectors. I wanted to bring this idea to the artomats as well, because the project really lends itself to division of a whole. Artists generally send in boxes of their work in sets of 50 or 100. These get divided up between machines throughout the art-o-mat-verse. Most machine curators order from artists in groups of 10, due to machine capacity. In ArtoMat Tags artomat, watercolor mini, kerplunk, What Is Artomat?